Sherlock Holmes sees World War I unfolding 20 years too early. Political assassinations are rampant in Europe. 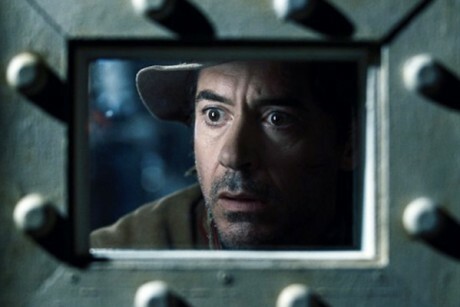 Sherlock Holmes (Robert Downey Jr.) suspects that the killings are orchestrated by none other than his greatest adversary Professor Moriarty (Jared Harris). It is up to Holmes and his chief ally Dr. Watson (Jude Law) to stop Moriarty, before all of Europe is engulfed in war. Sherlock Holmes: A Game of Shadows followed up the 2009 movie. The writers of Sherlock Holmes (2009) more or less just constructed original characters and slapped the names of famous literary ones onto them. Despite not exactly being a faithful representation of the source material, written by Sir Arthur Conan Doyle, I enjoyed Sherlock Holmes as a movie. So how did A Game of Shadows hold up? Much like its predecessor, A Game of Shadows had a lot of personality. Despite many of the environments being pretty obviously CG, A Game of Shadows had a cool (if not terribly realistic) 1890s atmosphere especially in downtown London and Paris. As someone who knows a little more about the history of firearms than I should really be willing to admit, I did notice that many of the firearms used in the movie (like the Mauser C-96) should not have even been invented in 1891, when the movie takes place. Much of the movie also showcased the wisecracking Downey as Holmes to straight man Law’s Watson. What also makes a return is Holmes planning his fights before actually executing his attacks; unfortunately I felt the movie was just a tad too much in love with that. The opinion I have with Sherlock Holmes: A Game of Shadows is very similar to what I had with many of the more recent James Bond films in that I felt that it was an extremely flashy movie (with an appearance from Stephen Fry no less), it had little below the surface. A Game of Shadows had a production philosophy that greatly favored style over substance. That said, overall I can say I had fun watching Sherlock Holmes: A Game of Shadows. As someone who enjoyed 300, I am perfectly comfortable admitting that I enjoy mindless action if I know the movie was more intent on being stylish to begin with. Thus, if you enjoyed 2009’s Sherlock Holmes and enjoy a considerable amount of CG in your movies, then I would suggest giving Sherlock Holmes: A Game of Shadows a shot. It was fun, but much of it left a bit of a “been there, done that” impression on me. This is the weakest 3 out of 4 I have given in a while. Jared Harris was great as Moriarty, as were Robert Downey Jr. and Jude Law in their respective roles. A Game of Shadows was a really fun movie overall, but if you’ve seen Sherlock Holmes, then you should have a good idea what to expect. I should also mention there was a scene where Watson was facing off a sniper that seemed almost like it was taken out of Enemy at the Gates.